Home > Understanding > How Does a Brain Aneurysm Develop? Like most diseases, brain aneurysms develop for reasons that may be “congenital” (i.e., the person was born with some defect in the brain artery wall, or an abnormal communication in the brain circulation or, e.g., a hereditary disease which lead to and worsened a defect in a brain vessel wall) or “acquired” (i.e., the person was not born with any such defect, but some event or illness during life lead to the development of the brain aneurysm). Although the congenital theory was thought to be more important in the past (and it still is in cases of persons with inherited connective tissue diseases which weaken the artery wall from the beginning), it is now thought that acquired reasons are the main ones underlying the development of brain aneurysms. Perhaps the most significant of the acquired reasons are smoking (which is associated with injury to the blood vessel wall, particularly the endothelium; and high blood pressure (hypertenstion); which causes additional stress on the blood vessel wall). How and why brain aneurysms develop really relate to properties of the wall of the blood vessel. As reviewed elsewhere, the artery wall is made up of a number of layers, each of which plays an important role in the overall strength and resilience (flexibility) of the vessel. In particular, there is only one elastic layer in the brain artery (there are two elastic layers in arteries elsewhere in the body), which itself tends to have many normal openings (perforations), and anything that damages this layer will predispose to a brain aneurysm forming in this region of the artery. Also, the smooth muscle layer of brain arteries has certain naturally occurring defects (isolated regions where the layer may be thinned out or absent), particularly where artery branch points (arterial bifurcations) occur. This makes aneurysms more likely to occur in such regions. 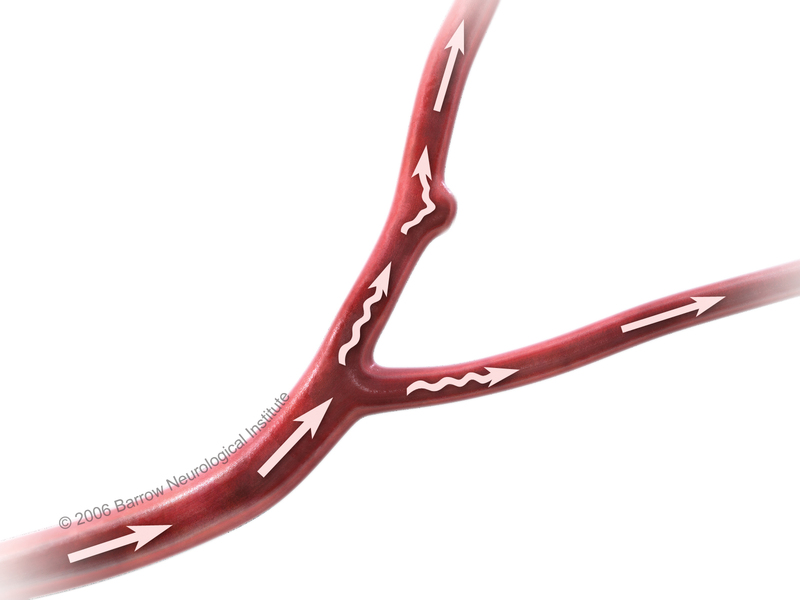 In addition, at arterial bifurcations, the forces exerted by the flow of blood (hemodynamic forces) tend to be increased relative to other segments along the artery, and any condition which increases blood flow pressure and turbulence (such as high blood pressure and high cholesterol) will aggravate the tendency for this part of the artery to balloon out as a brain aneurysm. An aneurysm starts to develop on one side of the arterial wall. 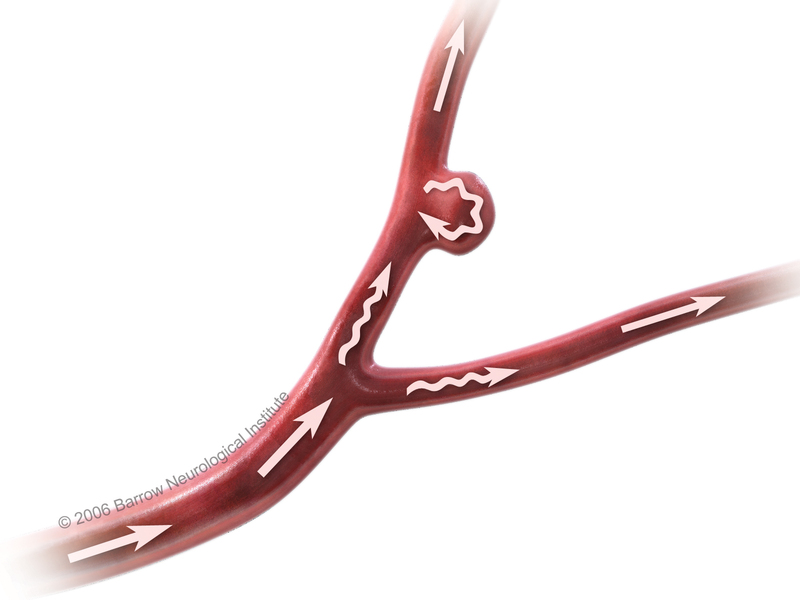 An aneurysm starts to develop on one side of the arterial wall and expands over time. As the aneurysm enlarges, a “neck” may become apparent (arrowheads). Blood flow in the body or sac of the aneurysm (curved wavy arrow) becomes more and more turbulent. 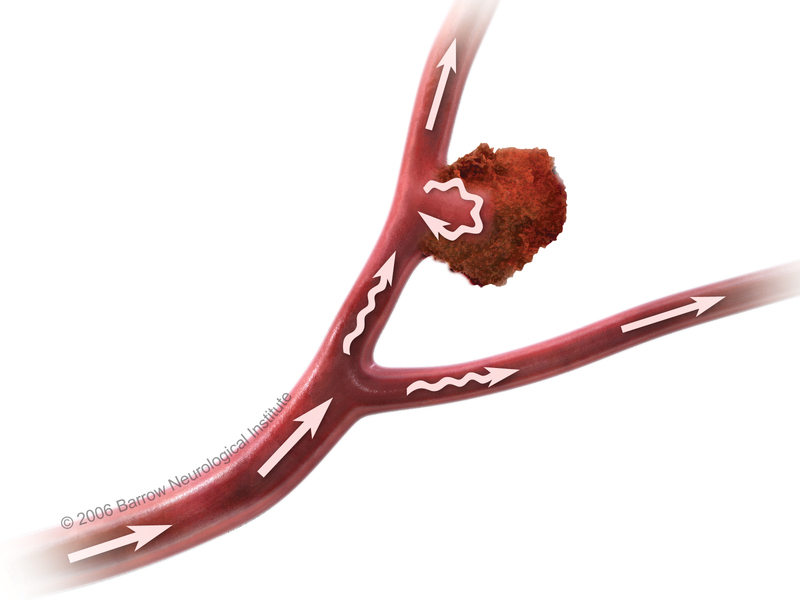 The turbulence leads to progressive weakening of the aneurysm wall, especially at the top or dome of the aneurysm. 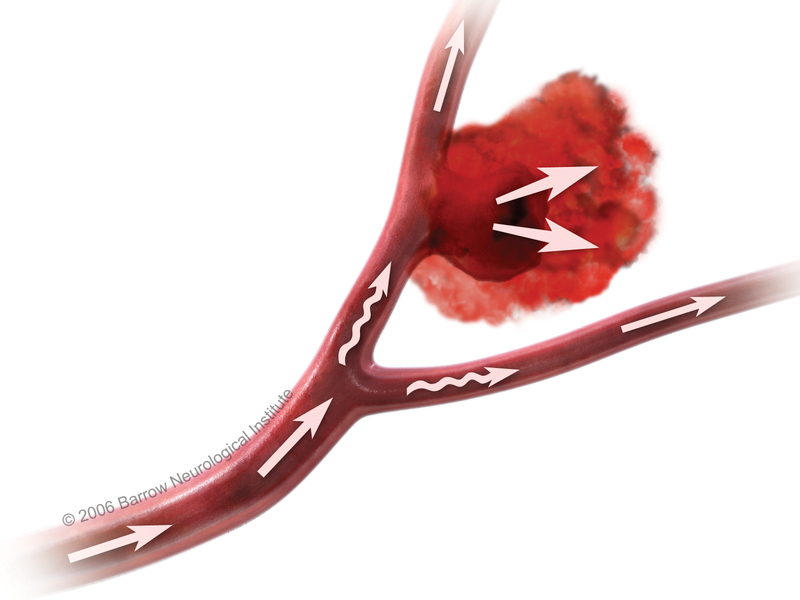 The turbulence leads to progressive weakening of the aneurysm wall, especially at the top or dome of the aneurysm. Eventually, the aneurysm ruptures. Blood gushes from the artery and enters the subarachnoid space where it forms a clot. This event is referred to as a Hemorrhagic Stroke .